Soft shades of PASTEL in MULTICOLOR combinations, the tones are light and feminine and most often worn in springtime, but certainly these colors that started as favorites in childhood are wardrobe accents throughout a lifetime! Handbag and jewelry accessories, you can use pastels as light accents with darker colors, see how they might be included in the mixes below. By The Artful Soul, pin set in mixed media polymer clay and resin. The 2 x 1 inch pin is a silver polymer clay background, with purple and pearlescent lavender resins, silver and gold powders, apple green Swarovski crystal accent. Earrings of the same components are 1-3/4 inches long and slender, very light, surgical steel earwire. By The Artful Soul, pin in mixed media polymer clay and resin. Orientation is roughly vertical with barpin clasp. 3-1/4 x 1-3/8 inches, the background is light golden beige, with pearlescent resins in pastel peachy-pink, mint and gold. Fine metallic silver and gold powder accents with leaf embossed pattern, crystals sparkle in rose, green and topaz yellow. By The Artful Soul, pin in mixed media polymer clay and resin. Orientation is roughly vertical with barpin clasp. 2-3/4 x 2 inches, the background is light golden beige, with pearlescent resins in pastel peachy-pink, mint and gold. Fine metallic silver and gold powder accents with embossed patterns, a large 25mm clear AB crystal sparkles brilliantly in reflective pink, aqua, mint and gold. 2-1/4 inches long on gunmetal earwire, 1/4 inch across. Simple flat copper sheet is embossed with patterns, then washed with bands of teal, violet and gold color. 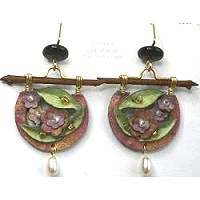 2-1/8 inches long including goldfill earwire, 1 inches across natural twig. Handmade paper box is colored in surf blue with golden marbling. Inside is folded orchid color leave with white pearl. Suspended by gold wire from natural twig and clear bead accent. 1-7/8 inches long including goldfill earwire, 1-1/8 inches across twig. Handmade paper semi-circle in background holds the folded forms of flowers and leaves, colored softly marbled dusty rose pink, lavender, and pale green. Dotted by tiny beads, a single white pearl dangle below, everything suspended from natural twig by golden wires. 1 inch long on sterling earwire, 3/8 inch across. The silvertone rectangular frame holds an oval crystal in light turquoise blue color, accented at by tiny glass and crystal beads in purple, lemon-lime and blue. 1/2 inch long rectangular pendant, 3/8 inch across, features an oval light turquoise blue color crystal, with tiny glass and crystal bead accents in purple, lemon-lime and blue colors. Suspended from steel chain, 16-18 adjustable length, lobster clasp. Graceful teardrop shape of silver-plated metal drops 1 inch on sterling earwire. 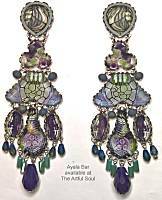 The mosaic of glass and crystal beads includes colors of lavender, mint, peridot and lemon. 1-5/8 inches long including gold covered nickel-free surgical earwire, 1/2 inch across. Graceful elongated teardrops of brass are coated in amethyst purple into light lavender. Pendant with Swarovski crystals suspended on sterling wire with bail loop is 1-3/8 inches long. Bicone crystal colors are fuchsia, yellow, peach, orchid, gold, green and blue. Squared rhinestone spacers between central elements. Pendant sold without chain, optional chain addition.